This is the first of six events, not time periods, marking the creation of the physical world. This first event is characterized by the creation of light that illuminates a preexisting1)Meaning that when the physical world was created a primordial substrate was already in existence primordial substrate. By representing the creation as a series of seven sequential, linear, non-repeating events in space, the author lays the groundwork for the establishment of ethical monotheism – a radical departure from other competing cosmologies. When Elohim first created the heavens and the earth, the earth had been formless and void and darkness was above the face of the Deep and the spirit of Elohim hovered above the surface of the waters. However, most conventional English translations are ambiguous in that they can be read in either of two ways: The most common interpretation, and the one reflected in modern Christian doctrine, is that God’s first act of creation was to create something (a dark and formless primordial substrate) from nothing (creatio ex nihilo) , after which God created the light. When God first created light, the heavens and the earth were formless and void And Elohim hovered over the deep. Creatio Ex Nihilo God’s first act was to create the primordial substrate (verse 1:1) the result of which was a formless, darkened watery world (1:2). Creatio Ex Materia When God performed His first creative act (the creation of light, verse 1:3), a formless, darkened, watery world was already in existence. As mentioned above, the first alternative, creatio ex nihilo, reflects the Christian doctrinal understanding of creation. The second alternative, creatio ex materia, claims that the first two verses are an introductory clause summarizing the whole of the creation process from vv 1:3-1:31. Surprising to most of us raised as we were on the creation from nothing model, the second version is more widely accepted among scholars as reflecting the true intent of the author. The supporters of the traditional translation point out that most of the ancient commentators including Philo4)Yonge, Charles Duke (1854). “Appendices A Treatise Concerning the World (1), On the Creation (16-19, 26-30), Special Laws IV (187), On the Unchangeableness of God (23-32)”. The Works of Philo Judaeus: the contemporary of Josephus. London: H. G. Bohn, Augustine5)The Nicene and Post Nicene Fathers First Series, Volume 1 The Confessions and Letters of Augustine with a Sketch of his Life and Work, 1896, Philip Schaff, Augustine Confessions – Book XI.11-30, XII.7-9, John Calvin6)Commentaries on The First Book of Moses Called Genesis, by John Calvin, Translated from the Original Latin, and Compared with the French Edition, by the Rev. John King, M.A, 1578, Volume 1, Genesis 1:1-31, John Wesley7)John Wesley’s notes on the whole Bible the Old Testament, Notes On The First Book Of Moses Called Genesis, by John Wesley, p.14:, and Matthew Henry8)Henry, Matthew. Commentary on the whole Bible. Christian Classics Ethereal Library. 1 (Genesis to Deuteronomy) ([online] ed.). Grand Rapids, MI: accepted the ex nihilo interpretation as indeed, they did9)See, for example, Wenham, Gordon J., “Word Biblical Commentary: Vol 1”, Thomas Nelson publishing, 1987, p 13.. However, this understanding is misleading. In fact, it misrepresents how the earliest commentators understood creation. Among the early community of ex nihilo advocates, notably Philo and the early Christian Fathers, there existed disagreement over exactly when God’s first created act occurred. Philo and the Fathers10)The philosophy of the Kalam. Structure and growth of philosophic systems from Plato to Spinoza, Harvard University Press. pp. 779: argued that the creation story assumed the preexistence of the primordial substrate and it was upon this substrate that God operated. They argued that it was this primordial substrate that had been created ex nihilo – at some time before God created the light. In other words, Philo and the earliest Christians did not doubt that God created (or had the power to create) ex nihilo. But, they manifestly did not view the text of Genesis 1:1-2 as being about ex nihilo creation. Divinely ordered ex nihilo creation simply was not in view because “how” or “when” the universe came to be does not contribute to what the inspired author meant to convey. Until recently, there was little grammatical support for either alternative. Thus, very few English translations, with the exception of the YLT (Young’s Literal Translation11)Published in 1862 and revised in 1898, Robert Young produced a translation that is very close to the Hebrew texts available to him at the time., took a position one way or the other, choosing instead to let the text be interpreted by its readers. The YLT’s is instructive and, while its English is bit archaic, it was nevertheless explicit – the author had ex materia in view. Recent advances in our understanding of Hebrew grammar have largely confirmed Young’s translation. In fact, these advances have improved our understanding of the Hebrew verbal system so much that many biblical scholars now take the view of Philo and the early Church fathers who understood that verses 1 and 2 describe the initial state of the universe prior to God creating light. In other words, Philo and the earliest commentators had this correct all along. The text, properly understood, describes creatio ex materia. Unfortunately, the advances in scholarship have not yet, as far as I know, been incorporated into any of the popular English Bibles. For the time being, creatio ex materia is reflected largely in the newer scholarly translations12)See, for example, Richard Elliott Friedman, “Commentary on the Torah”, p. 6 or Nahun S. Sarna, “The JPS Torah Commentary: Genesis”, p 5. and, of course, the translation presented in this book13)For a detailed discussion of how the grammar dictates the translation, see the discussion of creatio ex materia in the appendix. created: This word is translated from the Hebrew verb, bara, meaning “divinely created” – The adverb, divinely, is entirely appropriate because even though bara is used more than fifty times in the Bible, only God is its subject. When biblical authors use words that are specific to God, such as bara, the implicit assumption is that the word connotes a characteristic unique to God. Since bara expresses God’s creative activity and not man’s, we assume that bara is qualitatively different than asah14)A different form of the verb aseh., its non-divine counterpart, but such a difference is not attested in the Bible. But, this may not be all there is. Nahum Sarna15)Nahum M. Sarna, “The JPS Torah Commentary: Genesis”, p27. adds that words whose use is restricted to God also serve to accentuate God’s majesty and His ‘otherness’. Using such words, Sarna remind us, emphasizes that God is beyond human imagination. the heavens and the earth, הַשָּׁמַיִם וְאֵת הָאָֽרֶץ (hashamayeem vəet haaretz): Literally, this translates to “the skies and the earth” because the ancient Hebrews had no conception of what we today conceive of as heaven. From a literary point of view, skies make more sense because the phrase “the skies and the earth” is likely a merism – a figure of speech meant to indicate a range of meanings16)We’ll encounter another famous merism in the second creation story (v 2:9) where God warns mankind to avoid the tree of the knowledge of good and evil.. For example, in the sentence, “Jill knows cooking from A to Z”, the phrase “from A to Z” is understood to be a merism meaning that Jill knows everything there is to know about cooking. In v 1:1, the phrase “the skies and the earth” are likely intended to mean all of creation which, to the ancient Hebrews, was encompassed by the earth and sky. This certainly fits with the ex materia model of creation in which vv 1:1-2 summarize the actual creation described in vv 1:3-31. However, I chose to retain heavens in my translation because, well, I like (or have grown used to) the rhythm of the verse. formless and void: Translated from the Hebrew תֹהוּ וָבֹהוּ (tohu va-vohu), this phrase occurs again in Jeremiah’s prophetic vision of the return of the primordial chaotic state (Jer 4:23-27). As such, there can be no doubt that the author is referring to the initial chaotic state of the world. Deep: This is a translation of a Hebrew proper name, תְה֑וֹם (Təhom). In most English Bibles, Təhom is rendered as “the deep” or “the waters” or something similar. However, comparisons with similar stories in other cultures call this translation into question. In fact, these more recent studies suggest an intriguing alternative: Təhom might well be a reference to a pagan goddess in a competing creation story? A goddess the author of Genesis intended to demythologize. Supporting this thesis are two observations: First, from a purely philological perspective17)Philology is the study of language in written historical sources; it is a combination of literary, historical, and linguistic research. More simply put, philologists study the historical development of languages. In this case, some philologists claim to have traced the word Təhom back to the sea-goddess Taimat through various written stories and linguistic analysis., Təhom is thought by some scholars to be a reference to the name Tiamat, the goddess of the salt water in the Babylonian creation myth, Enuma Elish. Second, Təhom occurs in the Bible twenty-one times and, from a purely grammatical standpoint, always appears as a proper noun18)meaning that the word never, in its 21 instances in the Bible, appears with a definite article. The absence of the definite article, while not conclusive, is a characteristic of proper nouns in biblical Hebrew.. If Təhom is a proper noun (in other words, the name of something or someone) it may have been understood by the ancient Hebrews as the Hebrew version of the much more ancient Akkadian name, Taimat. In addition to these two reasons however, there is another reason to suppose that Təhom might refer to Tiamat of the Enuma Elish. The Genesis creation story serves (among its many purposes) the objective of demythologizing the supernatural characters of other competing creation stories – the most prominent of which was the Enuma. As a polemic work, Genesis’s author may be representing Elohim as overpowering Təhom (a.k.a Tiamat, or the deep darkness she connotes) by creating light and exposing her for what she was – just a vast abyss, an emptiness without substance. the spirit of Elohim: The English word spirit in this phrase is translated from the Hebrew word, ר֣וּחַ (ruach). Ruach has various meanings other than spirit, notably wind or breath. More generally, ruach is thought to express the idea of “air in motion”. In living beings (including animals) ruach is synonymous with breath. In this text, however, ruach seems more likely to be a metaphor for the immaterial and ineffable presence of the transcendent God. Later, in the second creation story (2:7), it is God’s נִשְׁמַ֣ת (nishmah, also translated as breath), not ruach, that is used to animate mankind. This has some theological implications in that God’s spirit (ruach) was not passed to mankind, just His breath (nishmah). Thus, nishmah is regarded as something less that God’s spirit but, given its divine origin, nishmah is nevertheless thought to constitute the force behind man’s rational and moral life. hovered: The English word ‘hovered’ is rendered from the Hebrew word, מְרַחֶפֶת (mərachephet) and describes the state of the spirit of God immediately before God’s first creative act. The use of this word is curious, if only because nowhere else in the Hebrew Bible is the spirit of God pictured in this way. One thought, however, is that the transcendent God enters His created world in spirit, not in His physical body – an observation in accord with modern physics since the idea of an object with physical properties (mass) can not exist outside the universe built to hold it. It is through His spirit that creation is commanded to occur. But, if such were the case, why didn’t the author subsequently write “the Spirit of God said…”. Perhaps it was understood by the ancient reader that the distinction between the Spirit of God and the physical God was unimportant. In any case, the distinction between God and His spirit remains elusive. Then Elohim thought, “Let light come into being.” And light came to be. Then Elohim thought (וַיֹּאמֶר אֱלֹהִים — vayyomer Elohim): The root meaning of the verb, here translated as thought, אָמַר (amar), has a wide semantic range. In all commercial Bibles I’ve studied, amar has been rendered, accurately, I think, as “said”. Indeed, in all other English translations its occurrence in this verse is rendered “Elohim said” (or “God said”). So why translate the phrase as “Elohim thought”? At a word-for-word level, amar is reasonably translated as ‘said’. The problem with this choice, however, is the context of the verse. To whom is God speaking? In biblical Greek, the English ‘Word’ is translated from λόγος (logos), meaning a word by which an inward thought is expressed, or the thought by itself19) Liddell and Scott’s Greek-English Lexicon, Abridged, Simon Wallenburg Press, 2007.While many Christians interpret ‘Word’ as Jesus, an equally plausible translation20)And one that does not counter the idea the Christ is the personification of Wisdom, Thought, or Word., is that St. John may be echoing the ancient psalmist who wrote “with wisdom you make all things” (psalm 104:24). In other words, John and the psalmist could be writing that, insofar as v 1:3 is concerned, God simply thought of what was to be (light) and it came to pass. In fairness, some scholars argue that throughout Genesis 1 God is speaking to His heavenly court. This idea is particularly evident in Genesis 1:26 in which God announces His intention to create mankind. In my opinion, the existence of a heavenly court has strong support in the subsequent verses and I translate the text accordingly (using ‘said’). But not here in 1:3 when nothing but the primoridal substrate is in existence. I am, therefore, partial to the understanding that God is thinking to himself in which case an equally good translation is, “Then Elohim thought”. Let light (יְהִי א֑וֹר — yəhi or): The literal rendering of the Hebrew is simply “be light” or “become light”. It’s as if God could simply think of the existence of light and it was so. However, since the verb is in the jussive mood (connoting a demand or an imperative), many translators, myself included, believe this mood is best expressed using the word “Let”. 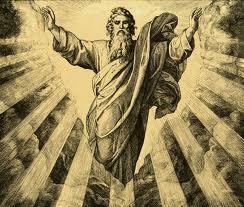 In other words, God is depicted as exercising divine authority by allowing light to come into existence. This event is the metaphorical match that lit the fuse initiating the Big Bang. come into being: The verb in question, יְהִ֣י (yəhi), can be translated as either “be” or “become”. The latter, I think, best captures the sense that light comes to exist where it had previously not existed. Interestingly, apart from the creation of light, all of God’s other creations are accomplished by separating, shaping, or transforming pre-existing matter. By contrast, light appears, not because of some physical effort on the part of God, but simply because of a thought. I prefer, therefore, “come into being” as more representative of God’s creation semantics. After light is created, the world is still formless. Whether the author meant to convey the idea that the formless and void primordial substrate is now visible is not clear. And light came to be: This is the realization of the command “Let light come into being”. In its simplest understanding, this phrase is the author’s way of conveying to his audience that God’s creation succeeds. Historically, Jewish and Christian interpretations regard light as symbolizing life and blessings of various sorts (Psalm 19:1-6, 27:1, 49:20, 97:11). Interestingly, as many commentators have noted, the celestial bodies that the ancient Hebrews associated with light had not yet been created and placed in the heavens21)Sarna adds “The notion of light independent of the sun appears again in Job 38:19. Here God challenges Job to tell Him where he had resided during the first days of creation. As an aside, the source of this supernal, nonsolar light of creation became a subject of rabbinic and mystical speculation. Genesis Rabba 3:4 expresses the view that this light is the effulgent splendor of the Divine Presence. Psalm 104:2 with its theme of creation, describes God as ‘wrapped in a robe of light.’” (N. M. Sarna 1989) p. 7.. Resolution of this seeming contradiction must wait until the commentary associated with verse 1:5. And Elohim saw the light as good. Then, Elohim caused the light to alternate with the dark. saw…good: The Hebrew word from which saw is translated is וַיַּרְא (vayyar) means “and-He-saw”. Its root, רָאָה (raah) or “He saw”, is literally the process of seeing with one’s eyes. In the context of this verse, however, vayyar is probably better understood as connoting a process by which God inspects22)(Harris, Archer and Waltke 2003) n.p. 295.0 the outcome of His creative act (the creation of light in verse 1:3) and finds it to His satisfaction whereupon He declares the created light to be good. The Hebrew word for ‘good’, טוֹב (tov), does not, in the opinion of many (most?) scholars, add moral content to this verse. A more likely understanding is that the created light refers to its fitness for God’s purposes23)Sarna and Umberto Cassuto are two scholars whose views differ from the consensus. Sarna understands the judgment to be a reflection of God’s goodness (Sarna 1989) p. 7, while Cassuto suggests that by judging light to be ‘good’. and withholding His judgment of the dark (but, see notes on Təhom), Elohim means “to prevent the misconception that the darkness is also good.” (Cassuto 2005 p. 27). However, no matter how viewed, the author clearly implies that God had certain expectations to be met and so was compelled to examine the results of His creativity. After assessing (vayyar) whether His expectations had been met, He rendered His judgment – the light was good (tov) because it met His requirements. But surely this raises the question of why would an omniscient, omnipotent being feel compelled to inspect and judge His creation? Didn’t God already know His creation would succeed in a manner exactly in accord with His wishes? The answer, to be faithful to the plain meaning of the text (either Hebrew or its English equivalent), must be no! In this verse, God is not portrayed as omniscient in the fullest sense. God is certainly omniscient in the sense of knowing all that is possible to know. But some things are unknowable – from the outcome of a [perfectly] random event to the time and location of a quantum fluctuation. We’ll see another example of an outcome not in accord with God’s wish in verses 1:11-12 in which the author portrays the earth as unable to meet God’s command to create fruit trees as instructed. Now, this is crucial to the understanding of what comes next in verse 1:5. Here, the passage of time (as measured by the occurrence of alternating light and dark periods) is manifestly not in view. Indeed, most of us, out of habit probably, simply read into the text the notion of time – because time is what we moderns often think of when we use the words ‘night’ and ‘day’. But we would be wrong! The Hebrew is more explicit (and becomes even more explicit in the next verse). Here, light and dark expressed in this verse is more like the white and black squares of a chessboard. There is no concept of time in this verse (nor any of the previous verses, for that matter). Light and dark are arranged to alternate spatially, not temporally. Let’s now ask if any scientific theory exists that might justify author’s analogy of time as days and nights adjacent to one another instead of days and night following one another? Of course, the latter is how we experience time. Thus, if the former is to stand as a reasonable analogy, do you see that the past, present, and future must exist simultaneously! The answer is yes, and this video, excerpted from the documentary “The Fabric of The Cosmos“, offers an intriguing hypothesis for how the past, present, and future exist at the same time. A simpler analogy (though scientifically less accurate) might be to imagine time as a film-strip and each frame in the film strip as a slice (quantum?) of time. Insofar as the Genesis depiction of time and space are concerned, God is a sort of cosmic editor able to create and manipulate the images of any arbitrary frame and, in so doing, change how events are played out as the “film advances”. Then Elohim called out to the light, “day”. And, to the dark He called out, “night”. And there was evening and there was morning, a first day. While not obvious from a modern point-of-view, this verse would have been understood by its ancient, late Bronze Age audiences as completing the picture of God’s transcendence. In the first verse He is portrayed as transcendent over space (“the heavens and the earth”) and in these two verses (1:4-5), He is portrayed as transcendent over time24)From God’s point of view, night and day exist simultaneously in space.. To summarize, God is portrayed as “looking down” on s pace and time as we might “look down” on a chess board and its array of pieces. By portraying time (light and dark) in this manner, the author begins laying the literary groundwork necessary to establish one of the great moral truths of life. Specifically, in the absence of linear time – a flow of time forever forward (i.e., alternating periods of light and its absence), in the presence of linear time, we are able remember the past, experience the present, and contemplate the future. In the absence of time, there can be no moral and ethical ordering of human life because the consequences of human endeavor cannot be experienced in a way that would permit actors to change their behaviors. It is to this claim we now turn. And for this to make sense, we must understand how nature, as perceived by the ancient cultures of ancient Mesopotamia shaped their understanding of time. It would be worthwhile to note that the author of Genesis presents a view of time totally at odds with those of other ancient Mesopotamian cultures. In verse 1:5 we are presented with a radically different view of time compared with the view of time held by the surrounding pagan cultures. To better appreciate the two views of how time proceeds, we can examine a contemporary model of the ancient pagan concept of time as expressed in Harold Ramis’s wonderful 1992 movie, Groundhog Day25)See the Wikipedia entry for “Groundhog Day (film)”. In this movie, Phil Connors (played by Bill Murray) becomes stuck in a time loop in which he relives Groundhog Day over and over again. Confronted by the knowledge that the events of the present day have no consequences in the next (even suicide fails to stop the time-loop) Phil becomes self-indulgent and hedonistic. There is no accountability in a world in which time does not pass. Groundhog Day artfully expresses the concept of time held by the pantheistic religions of Mesopotamia. They, too, believed that time was cyclic, not unlike the time-loop in Groundhog Day. This view arose because time was seen as intimately tied to the cycles of nature. The people of these ancient cultures noted the changing positions of the stars that always returned to their origin (the new year); they watched as the moon waxed and waned, and they moved their flocks from mountain to meadow and back again as the seasons cycled between spring, summer, fall, and winter. And, as no surprise, the passage of time, when tethered so intimately to nature, was not viewed as independent of nature. To the people of these ancient cultures time and nature were inseparable. By contrast, we moderns view time as did the ancient author of Genesis – as divorced from nature. Which explains, in part, why Groundhog Day was such a delightful movie. … little or no concern. It was life on earth, in the past and the present, which was related to the decree of the gods that [when associated with the annual decline and renewal in nature] suggested a periodicity, a cycle of death and revival. “The gods assembled again in the Chamber of Destinies to determine the course of events during the forthcoming year and because this renewal lacked any personal application of judgment … the New Year Festival was not only the occasion of the annual renewal of society; it also constituted a new start for its members…”27) Held during the month of Nisan, the month in which barley becomes ripe. In other words, it was the gods that determined one’s fate, not one’s personal character and life decisions. And it was the gods that must be appeased. Because time was cyclic, each New Year becomes an opportunity for the pagan to appease the gods and beg for a better year to come. The concept of moral accountability was largely irrelevant in pagan cultures. Like the time loop of Groundhog Day, the pagans believed that the events of last year could be ignored in the next by a sufficiently earnest appeasement, either ritual or sacrificial. … of the Ancient Near East did not conceive of time in terms of a horizontal, linear ordering of events reaching from a historical beginning to a final consummation of all things. Rather, they regarded time as cyclical, the annual reordering and revitalizing of the universe. Their creation myths were recited at annual New Year’s festivals as magical words to accompany a magical ritual in order to reactualize the original cosmology, the passage from chaos to cosmos. In mythopoeic thought time has no significance and history no meaning. As Waltke reminds us, the Genesis author, unlike their pagan counterparts, conceived of time as moving forever forward, unrelated and untethered to the cycles of nature. But, this raises the question: how did the Hebraic conception of time arise? Surely, the ancient Hebrews lived under the same stars, saw the same waxing and waning of the moon, and ordered their lives to the same seasons. How (or why) did they conclude that time, to use Waltke’s words, was “a horizontal, linear ordering of events”? The answer may lie in the figurative representation of time in the Genesis 1 creation account. It is here, in first five verses of the Bible and for the first time in written history, that we encounter the representation of time from the viewpoint of one who stands outside of time (vv 1:4-5). In other words, the viewpoint of a transcendent being – the God of Genesis 1 – and it is the viewpoint the author would have us adopt as we read the text. In literary terms, the author accomplishes this by placing the audience in the omniscient point of view. In other words, we are invited to see what God sees – as if we were looking over the shoulder of the creator God. Viewed this way, the steady cadence of passing days (verses 1:5, 8, 13, 19, 23, and 31) calls our attention to a sequence of some kind. However, because we watch the story unfold from an external frame of reference, time for the viewer does not exist. In this point of view, the seven days of creation are not temporal, but spatial – again, like the black and white squares of a chess board. The author of Genesis lays out the six days of creation. The text reads as if God is a cosmic historian describing the creation by pointing each of seven squares. When God describes the sixth, the students are called to look at all six squares of creation and share in God’s judgment that they are very good. This is all well and good, but is there textual support for this view? Absolutely. And to understand how this is represented, once again we must turn to the Hebrew text itself. And Elohim called to the light and the dark, “Yom”! But he does not! He names the light yom and the adjacent darkness, layla. In this verse (and the other day verses), day and night, like light and day are two wholly separate entities. In these verses keep in mind that yom simply denotes the presence of light 30)Interestingly, in Ugaritic, a cognate language to Hebrew, yom is used in exactly this way, i.e., to describe the presence of light as in, “Wow, it’s 4:30 in the morning and it’s already light (=yom) outside”. 31)(Harris, Archer and Waltke 2003) ref 0852.0, not the passage of time. Let me emphasize that once more. In verse 4 the word yom was the name God gave to the presence of light, not to a period of time. By the same reasoning, layla is the name given by God for light’s absence, again not a period of time. Yom and layla are represented as spatial, not temporal, concepts in the Genesis 1 creation story. They exist side-by-side, adjacent to each other. Let’s try to envision the world, from God’s point-of-view – a view unrelated to time (remember, the God of Genesis is standing outside of time and space). Returning to the chess board analogy, we might imagine that God’s creations are represented as occurring on the squares of a chessboard. A chessboard in which the white squares are named and numbered, for example, yom echad (י֥וֹם אֶחָֽד ) would be the first white square. Yom sheinee (י֥וֹם שֵׁנִֽי ) would be the second white square, and so on. The dark squares then, are named layla but they are not numbered. They simply serve as separators between the yoms. Note also that to move to the next [adjacent] yom, requires that we cross two boundaries – a boundary marking a transition from light-to-dark and a boundary marking a transition from dark-to-light. At this point, the Genesis author makes the idea of two such boundaries explicit, as we learn next. The translation of erev and voqer to evening and morning respectively is understandable and reasonable. It’s certainly understandable to we moderns if only because evening and morning constitute the end of specific periods of time – daytime and nighttime. However, in his magisterial commentary on Genesis, Nahun Sarna reminds us that erev and voqer in the biblical Hebrew, are better understood in the Genesis context as representing boundaries between light and dark32)(N. M. Sarna 1989) p. 8. It is in this sense that, in the chessboard analogy, erev is a boundary separating a white square on its left from a black square on its right. By contrast, voqer is the boundary separating a black square on its left from a white square on its right. Sarna suggests the words twilight and dawn as more apt rather than evening and morning. He argues that these terms offer a clearer view of the separation of light from dark described in verse 1:4. In this, I follow Sarna reasonably closely, but would translate the text a bit differently. And there was nightfall and there was daybreak, a first day. I chose daybreak because, like nightfall it has two syllables and preserves the cadence of the original Hebrew. Moreover, nightfall and daybreak connote events, rather than time. Therefore, by understanding erev and voqer as boundaries in space, not intervals of time, we may have a more accurate expression of how the author meant to represent God’s view of His created world – as discrete regions of adjacent light and dark spaces where time does not exist. Moreover, it is within each light space (yom) that particular and specific creative acts are accomplished33)Refer back to the video above in which time is represented as slices of time intervals – past, present, and future.. NOTE: having gone through great pain to show that the words ‘nightfall’ and ‘daybreak’ might more accurately represent God’s view of the sequence of events of creation, I will continue to use evening (voqer) and erev (morning) because to deviate from its traditional translation is jarring. Better to leave the more meaningful translation as a footnote. At this point, a plain reading of the text, given its historical-cultural context, implies that the author did not write a story in which elapsed time was in view. The intent of the creation account was not to demonstrate and exalt God’s ability to bypass the fundamental laws of cosmology (even if the author had known of them)34)This is a safe assumption, I believe, because among virtually all of the ancient cultures, the creative power of the divine, whether embodied in a single God or multiple gods, was never in question. Since everyone believed in gods who were able to created stuff and for whom miracles were commonplace, a story about divine power would have been rather mundane.. Indeed, rather than illustrate God’s miraculous ability to make in seven days what science demonstrates as requiring billions of years, the author’s intent was to express a radical re-imagining of creation as independent of time. This verse, as it happens, is the first of six verses expressing time as irrelevant and God’s creative activity not as time-driven but as event-driven35) In computer programming, event-driven models are commonplace. In these models the flow of a program is determined by events – mouse clicks, sensor outputs, or messages from other programs – not by the passage of time.. In this case, the events driving the story from yom to yom is the crossing of the two boundaries, erev and voqer into the next yom. During those six days, blocks of events are described and then we are told that a day passed. This is repeated in a totally objective fashion six times. It is as if there were a consciousness reporting the events from the outside looking in. There is no intimate relation between the events and the passage of time. The text, for example, does not state that five hours and twenty-five minutes into the third day God separated the water from the dry land; and then, after another nine hours and forty-five minutes, plant life appeared … No hint is given for the time each of these major events took37)(Schroeder 2009) pp.47-48. Hear O’ Israel, the LORD is our God, the LORD Is one (echad)! We now arrive at the nub of how the author meant for us to understand use of the Hebrew word yom. By representing yom as an event (the advent or appearance of light) and not as a duration of time, the author allows us to see creation through the Creator’s eyes – the point of view of an utterly transcendent being. In this view, time as we experience it, does not yet exist. And so, at the close of the first “day” of creation, the first, and arguably the most important truth in all of the Judeo-Christian traditions is revealed: God is transcendent over both space and time. But, there is a second truth that is only slightly less important. This truth also arises from the representation of time as independent of the cycles of nature – the rising and setting of the sun, the waxing and waning of the moon, the seasons, and the tides. Because time, as imagined and described in the creation story, is untethered to and independent of nature, the author is able to counter the prevailing pagan view of his day that time is simply part of nature. By insisting on representing time as a linear (non-cyclic) sequence of events, history is no longer made inconsequential and the metaphor of Groundhog Day no longer applies. In the chessboard analogy, a black rook in the first rank continues to protect those pieces it covers as the game progresses and the pieces change positions. The passage of time does not render inconsequential the rook’s presence. Put another way, the chess player cannot ignore an opponent’s rook the way Bill Murray’s character ignored the events of the previous day. In God’s created order, no time loop exists and the events of any given day are not erased. The New Year may still be celebrated, but in Genesis it is not an occasion of renewal. In making this point, the author is specific and unambiguous. The “days” of the creation story never repeat. In the spatial framework of Genesis 1, mankind cannot escape the consequences of its own actions. In other words, the Genesis 1 account establishes the basis for God’s ethical demands as imposed on mankind. This fundamental truth, that we are forever subject to the consequences of history, gives purpose to the Creator’s concern for mankind’s well-being on earth. We are to order our lives to His will, not because He is some arbitrary dictator, but because He reveals in Genesis that the lessons of history cannot (and are not to) be ignored. We are to learn from the past. This is the second great truth of Genesis 1. Our behaviors, both personal and collective, are consequential and that there is no future in which those consequences can be avoided. From the first yom to tomorrow’s, the Bible constitutes the ancient Hebraic understanding that we live in a consequential universe, by which I mean a universe in which how we live in the present must have consequences in the future. 2. ↑ For a more technical explaination than what follows go here. 3. ↑ In 1987, Gorden Wenham, in his “Word Biblical Commentary”, further subdivided the two alternatives into four competing proposals: (I) 1:1 is subordinate to the main clause, 1:2. (II) like (I) except that 1:2 is a parenthetic comment, (III) 1:1 is a main clause summarizing all the events described in 1:2-31, and (IV) 1:1 is God’s first creative act (Wenham, Word Biblical Commentary: Genesis 1-15 1987) p11-12 . 9. ↑ See, for example, Wenham, Gordon J., “Word Biblical Commentary: Vol 1”, Thomas Nelson publishing, 1987, p 13. 11. ↑ Published in 1862 and revised in 1898, Robert Young produced a translation that is very close to the Hebrew texts available to him at the time. 12. ↑ See, for example, Richard Elliott Friedman, “Commentary on the Torah”, p. 6 or Nahun S. Sarna, “The JPS Torah Commentary: Genesis”, p 5. 13. ↑ For a detailed discussion of how the grammar dictates the translation, see the discussion of creatio ex materia in the appendix. 14. ↑ A different form of the verb aseh. 15. ↑ Nahum M. Sarna, “The JPS Torah Commentary: Genesis”, p27. 16. ↑ We’ll encounter another famous merism in the second creation story (v 2:9) where God warns mankind to avoid the tree of the knowledge of good and evil. 17. ↑ Philology is the study of language in written historical sources; it is a combination of literary, historical, and linguistic research. More simply put, philologists study the historical development of languages. In this case, some philologists claim to have traced the word Təhom back to the sea-goddess Taimat through various written stories and linguistic analysis. 18. ↑ meaning that the word never, in its 21 instances in the Bible, appears with a definite article. The absence of the definite article, while not conclusive, is a characteristic of proper nouns in biblical Hebrew. 20. ↑ And one that does not counter the idea the Christ is the personification of Wisdom, Thought, or Word. 21. ↑ Sarna adds “The notion of light independent of the sun appears again in Job 38:19. Here God challenges Job to tell Him where he had resided during the first days of creation. As an aside, the source of this supernal, nonsolar light of creation became a subject of rabbinic and mystical speculation. Genesis Rabba 3:4 expresses the view that this light is the effulgent splendor of the Divine Presence. Psalm 104:2 with its theme of creation, describes God as ‘wrapped in a robe of light.’” (N. M. Sarna 1989) p. 7. 24. ↑ From God’s point of view, night and day exist simultaneously in space. 27. ↑ Held during the month of Nisan, the month in which barley becomes ripe. 29. ↑ In the discussion of this verse (1.5), the Hebrew word, ‘yom’, will be used where ‘day’ would normally have appeared. In doing this, I hope to call your attention to the undefined meaning of ‘yom’ at this point. 33. ↑ Refer back to the video above in which time is represented as slices of time intervals – past, present, and future. 34. ↑ This is a safe assumption, I believe, because among virtually all of the ancient cultures, the creative power of the divine, whether embodied in a single God or multiple gods, was never in question. Since everyone believed in gods who were able to created stuff and for whom miracles were commonplace, a story about divine power would have been rather mundane. 35. ↑ In computer programming, event-driven models are commonplace. In these models the flow of a program is determined by events – mouse clicks, sensor outputs, or messages from other programs – not by the passage of time. 36. ↑ Gerald Lawrence Schroeder is an MIT-trained Israeli physicist and author of “God According to God”, one of the references used in the preparation of this book.